In the pub near the Northern Sydney suburb of St Ives, where Prime Malcolm attended boarding school, one of the regulars has not joined the “I love Malcolm” fan club. When asked why, he replies: “I didn’t have a view on Malcolm Turnbull, until I met him.” It’s not a favourable view, and he says the same could have been said of a former Prime Minister, Kevin Rudd. This did not deter Turnbull from his goal of becoming prime minister. After pursuing journalism, writing for The Bulletin, and according to colleague Suellen O’Grady, pounding the keys of his typewriter so hard his desk shuddered, the man born to rule won a Rhodes scholarship at the end of 1977. David Dale, a journalist for the Sydney Morning Herald, met Malcolm Turnbull in the mid-70s, when he told Dale he wanted to be Prime Minister by the time he was 40. “For which party,” asked Dale. “It doesn’t matter,” replied Turnbull. His mother kept letters from his father, castigating her for leaving them, while he told Malcolm she hadn’t really left him. On a 2009 ABC Australian Story profile, Turnbull remembered what his father said: “No, she’s just gone to New Zealand to do some studies. She’s coming back. Don’t worry. Everything’s OK.” Everything was not OK, of course. Turnbull’s fortunes soared after he successfully defended Kerry Packer against allegations in the 1984 Costigan Royal Commission that he was “Goanna,” a figure linked to murder, drug smuggling and tax fraud. Turnbull said the commission was “one of the blackest episodes in Australian legal history.” Packer was extremely grateful to Turnbull for clearing his name. Nor was he hiding his money anywhere either. Turnbull set up a cleaning company with former NSW Premier Neville Wran and became a merchant banker. His business venture with Nick Whitlam, son of Gough, Whitlam Turnbull, went south in 1990, with Whitlam citing staff resentment against Turnbull, whose nickname in the office was “the Ayatollah.” After Whitlam’s departure, the bank was renamed Turnbull & Partners and Nick and Malcolm did not speak to each other for many years. There was another foray by Turnbull into Packer’s backyard, helping with the repurchase of Channel Nine from Alan “You only get one Bond in a lifetime,” Bond and the Tourang bid which prompted Kerry Packer to accuse Trevor Kennedy and Turnbull of treason, and prevented Packer from getting control of Fairfax. When Glenn Burge and Colleen Ryan wrote the definitive account of the Tourang saga, Corporate Cannibals, Turnbull demanded to see the galley proofs and insisted on minor changes, including footnotes. Manning sums up the brouhaha: “As a former journalist, Turnbull certainly knew how to make enemies in the media.” He also knew how to keep making money: Getting in early on the internet service provider, Ozemail, in 1994, earned him $40 million when it was sold in 1998. It also put him on the BRW Rich List, with an estimated $65 million. Then there was the Republican campaign. The Australian Republican Movement (ARM) was launched in 1990, run out of the offices of Turnbull & Partners, with financial support provided by Malcolm. Turnbull became chairman and poured $2 million into the ARM, until the fateful date of November 6, 1999 when Australia voted no to a republic in a referendum. After ten years of fighting the good fight, Turnbull gave one of his best speeches in which he blamed John Howard for the loss: “Whatever else he achieves, history will remember him for only one thing. He was the prime minister who broke a nation’s heart. He was the man who made Australia keep a foreign queen.” Of course, there were others who gave credit to Howard and Kerry Jones of the Australians for Constitutional Monarchy (ACM), including Labor’s numbers man, Graham Richardson, in an interview with Nine’s Laurie Oakes on the referendum broadcast: “You’ve got to pay tribute to Kerry Jones and John Howard. They’ve out-campaigned the ARM.” ‘Laurie Oakes responded.’ “It was an unscrupulous, misleading campaign but it was clever, Graham, but wasn’t the ‘Yes’ campaign fairly un-clever’?” Turnbull admitted the monarchist campaign of promising a referendum for a directly elected president worked but he added in his speech: “… Do not forget who told you to vote ‘No’ with the promise … a promise they never, ever intended to keep.” Columnist Peter FitzSimons, who helped with the 1999 campaign and is now involved in another one as ARM chairman, said he did not blame Turnbull for the success of the ACM’s strategy: “I don’t think Malcolm was responsible. I think it was a brilliant line from the monarchists.” Malcolm is still a republican, but a very quiet one these days. He’s even met the Queen. From here it was a long way to the top. Four hundred of his supporters showed up in Federal Parliament on November 29, 2004 to hear his maiden speech. Opposition Leader Mark Latham quoted John Lennon, saying the audience could “perhaps, instead of applause, they could just jangle their jewellery.” Turnbull continued to boost his profile, speaking out on unfair dismissal and work choices, before it was “dead, buried and cremated,” and climate change. Howard promoted Turnbull to Cabinet in 2007 as Minister for Water Resources and Environment. As things went sour for the Coalition Government in 2007, Turnbull told Howard he should consider resigning (at least he had the courage to do so). Malcolm had the fight of his political life in Wentworth, but managed to win. When he called John Howard to tell him the good news, the prime minister wasn’t very happy as he’d not only lost his leadership, but his seat as well. Empathy was still not a strong point with Malcolm. Turnbull became Opposition Leader in 2008 after behaving badly toward the incumbent leader, Brendan Nelson. Nelson suggested Turnbull had “a narcissistic personality disorder,” which took a battering with the Godwin Grech affair. It’s a long and complicated story, but can be summed up thusly: Grech was a Treasury official who leaked Labor policy details to Turnbull, persuading him that Prime Minister Kevin Rudd and Treasurer Wayne Swan had done an underhanded deal over a 1966 Mazda Bravo Ute (hence the nickname: “UteGate). The evidence for this was a fake email forged by Grech. It was a monumental blunder by Turnbull, made worse when Australian Story filmed the Opposition Leader as the story broke, prompting Lucy to say: “How can you concoct an email?” It led to a censure motion in Parliament by Kevin Rudd, who said Turnbull was not only not fit to be opposition leader, “but he has also disqualified himself from ever being fit to serve as leader of this country.” It was perfect at that moment, but it wasn’t the only time Kevin Rudd had gone too far in a political assessment. Despite this spectacular setback, the backbencher became a shadow minister, then a minister and quietly waited nearly six years to knife Tony Abbott and achieve the title he’s always wanted: Prime Minister Malcolm Turnbull. So far the new PM has lifted his popularity and pounded Labor leader Bill Shorten in the polls, who at one stage was rating 14 points as preferred prime minister to Turnbull’s 69 per cent. The jury is still out on whether Malcolm Turnbull is “born to rule” for as long as Menzies or Howard. Malcolm Turnbull is a fighter. 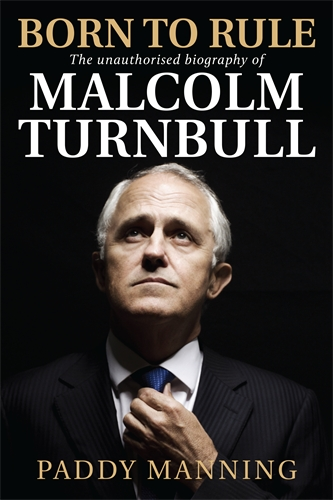 I can recommend Malcolm Turnbull: Born to Rule as a very readable and insightful profile of the Prime Minister, with myriad stories and comments. The former Fairfax business journalist Paddy Manning does get bogged down in some of the details on financial stories like Tourang, Ozemail, HIH and NBN, so you can skim through those chapters, but I applaud his footnotes – they’re at the back of the book so you don’t get distracted. And there are many: see pages 393-431. I also hate clichés (who doesn’t, except politicians), but I wasn’t as bothered by Manning’s use of them as the esteemed novelist and playwright Louis Nowra was in his excellent review of the book in The Weekend Australian of December 5-6. 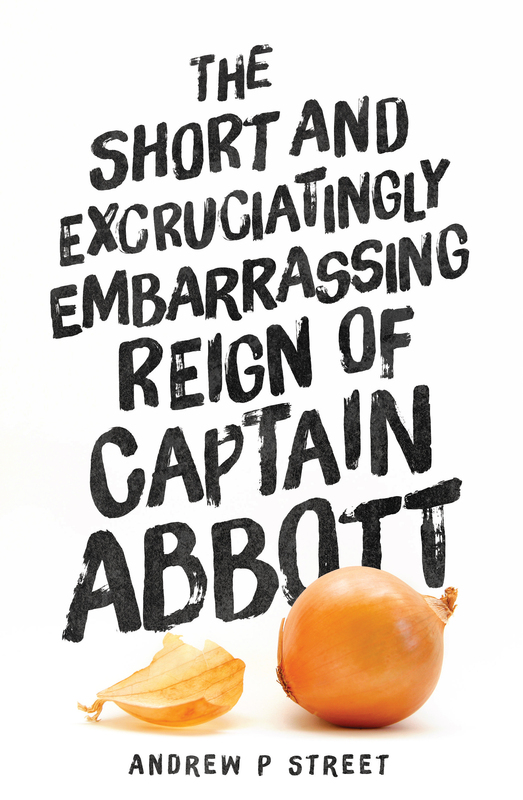 If you don’t mind reliving the short and excruciatingly embarrassing reign of Tony Abbott, and need a laugh or two, buy Street’s book. He’ll be very grateful. A great read again Tommy. Thanks, Moshe. We must catch up soon.